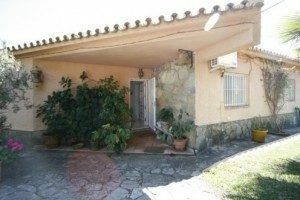 Here is a selection of property for sale in Spain. Unique villa in the heart of Elviria, Marbella. 8 bedrooms, 8 bathrooms, panoramic views, great for a large family or to convert into Boutique hotel. Further reduced!! Unique Villa in the heart of Elviria. Built about 10 years ago in the style of a typical Andalucia cortijo this house is perfect for the large family or would make a lovely boutique hotel. Quiet position in Elviria by the 18-hole Santa Maria Golf course, and within short distance of all facilities in Elviria. The accommodation comprises a portico entrance with antique front doors leading to a magnificent indoor court yard / patio with double height ceiling with natural light , Spacious lounge with open fireplace leading onto the terrace, separate dining room and fully fitted kitchen with Gaggenau appliances including and oven, gas and electric hobs, deep fat fryer and broiler etc. Dishwasher and two fridges with freezers. Master bedroom suite with large dressing room with extensive fitted wardrobes and en suite bathroom with bath and shower. Further bedroom suite with en suite bathroom, two further bedrooms with fitted wardrobes sharing an en suite bathroom. On the first floor there is a large living room with picture windows enjoying lovely views to the sea. An office area, one bedroom, a utility room with washing machine drier and ironing area and two bathrooms . There is further space at this level which could easily be used to make a total of 10 – 12 bedrooms. Lower level comprises a large bodega, wine cellar, gym with sauna, garage for at least 6 cars + storage facilities. Features and fixtures include A/C hot and cold, alarm system (indoor + outdoor), double glazing doors and windows (wooden frames), marble floors, passenger lift to all 3 levels, underfloor heating (entry level + first floor), video entry phone, wooden floors in master suite, etc. Independent staff apartment with further two bedrooms, one bathroom. Another 5 star property for sale in Spain from Bargain Properties. The property is accessed via a private driveway, surrounded by gardens with swimming pool. Possible access to the property from 2 streets. Ideal for the large family, alternatively convert the property into a luxury hotel!! Built 657 sq., Plot size 2.224 sq., 7 bedrooms, 7 bathrooms, 2 guest toilets. Villa, 6 bedrooms, 9 bathrooms, sea view and large plot originally priced 3 million Euros. Must be sold – Open to offers. Large plot and fantastic sea views. This is an exceptionally spacious detached Villa situated in a commanding plot just above the golden mile and enjoying panoramic sea views. The house is need of completing and the accommodation briefly includes an entrance hallway with feature semi circular staircase, guest w.c., large salon and dining room with access to a covered terrace, further sitting room with a second covered terrace and shower room. Kitchen Ground floor guest bedroom with dressing area and luxury bathroom en suite with bath and shower. On the first floor the master bedroom has a dressing area and luxury bathroom en suite with bath and shower, private terrace. There are 4 further bedrooms, all with fitted wardrobes and bathrooms en suite. On the lower level there is Gymnasium with shower room, sauna with with further shower room and an office with independent office. Utility room and large garage with parking for at least 4/5 cars. Landscaped gardens with pool and barbecue area etc. Quality finishes throughout, marble floors, under floor heating etc. Another 5 star property for sale in Spain from Bargain Properties. Great value 3 bedroom, 3 bathroom penthouse with extensive terraces, walking distance to the beach and all amenities. Stunning 3 bedroom, 3 bathroom duplex penthouse within walking distance of Puerto Banus, the beach and all other amenities. Exceptionally large terraces on both levels with partial sea views. Well maintained gated community with luxuriant sub tropical gardens and lovely pool area. This is a a very spacious and bright duplex penthouse situated in a secure gated community close to the beach and all other amenities. The community is gated and very well maintained. The accommodation briefly includes an entrance hallway, spacious lounge and dining area with open fireplace, access to an exceptionally large terrace with open views and all day sun shine. Fitted kitchen with granite worktops and built in Bosch appliances including oven, hob, dishwasher and fridge freezer. Utility room with washing machine. Bedroom with dressing room and fitted wardrobes and bathroom en suite, 2nd bedroom with fitted wardrobes and adjacent shower room. The master bedroom is on the upper level and includes an en suite bathroom with bath and shower. Further very large terrace with partial sea views and integrated jacuzzi. Garage parking space and store room. Cream marble floors. Hot and cold air conditioning. Another 5 star property for sale in Spain from Bargain Properties. Fabulous 3 bedroom, 2 bathroom duplex penthouse. Magnificent sea views, easy access to Puerto Banus and Marbella. Well priced beautiful and very spacious 3 bedroom, 2 bathroom apartment in prestigious location on the Golden Mile. Magnificent sea views. Easy access to both Puerto Banús and Marbella. 24 hour security. Open to offers for a quick sale. A rare opportunity to find a large 3 bedroom, 2 bathroom apartment in the golden mile, located in the prestigious Las Lomas de Marbella Club. The apartment affords open views towards the sea and is worthy of an early inspection. The accommodation includes an entrance hallway with guest w.c., spacious lounge/dining room with access to the south east facing terrace, fitted kitchen with appliances including oven, hob, dishwasher and fridge/freezer, Utility room with washing machine and an additional storage area. 2 garage parking spaces, and store room , marble floors, hot and cold air conditioning. Another 5 star property for sale in Spain from Bargain Properties. Communal gardens, 2 community pools, 24 hour security. Lovely family villa with great outdoor living area. Situated in established community, 4/5 bedrooms, 3 bathrooms. A lovely character 4/5 bedroom family Villa situated in an established community close to Marbella. The house has been refurbished with new bathrooms, fitted kitchen and uPVC double glazing. Lovely garden and extensive terraces and swimming pool. Superb outdoor living spaces. the property is arranged on two levels with the lower level currently housing the Master bedroom suite with its own sitting room and bathroom. This has been prepared to offer a separate apartment with its own access if required. The accommodation comprises an entrance hallway leading through to a lounge/dining room with access to the terraces and pool. Feature fireplace with cassette grate. Fitted kitchen with granite worktops, Balay oven and hob, dishwasher, fridge / freezer and washing machine. 3 bedrooms, all with fitted wardrobes and 2 modern bathrooms. The Villa features extensive covered and open terrace areas providing summer lounge and dining space with storage adjacent. There is an integrated barbecue and an extensive sun deck surrounding the pool. Another 5 star property for sale in Spain from Bargain Properties. Great Location, 2 bedroom, 2 bathroom apartment in La Maestranza,west facing, walking distance to everything. Beautifully presented and spacious 2 bedroom, 2 bathroom apartment situated in La Maestranza. Great location within a very short distance to all amenities including the supermarket. shops and restaurants. Puerto Banus and the beach are also walk able. Gated community with 2 pools (1 heated). This lovely 2 bedroom apartment is situated on the first floor overlooking the pool and provides exceptionally bright and spacious accommodation which briefly includes an entrance hallway, large lounge/dining room with access to a west facing terrace which includes a Jacuzzi. Fitted kitchen with built-in oven, ceramic hob, washing machine and dishwasher, also with direct access to the terrace. Master bedroom with fitted wardrobes and bathroom en suite, 2nd bedroom with fitted wardrobes and adjacent bathroom with large walk in shower. Hot and cold air conditioning, double glazing and window blinds. Garage parking space. Well maintained gated community with gardens and 2 pools, one of which is heated. This is a great property which is well worth an early inspection. Another 5 star property for sale in Spain from Bargain Properties. Best villa buy on Mijas Golf, 4 bedroom, 4 bathroom villa, brand new and built to high standards. Easy access to La Cala Hills, Fuengirola and La Cala. Villa built to high standards in a quiet position in Mijas Golf, with easy road access to amenities in La Cala Hills and within short reach of La Cala Golf Resort, Fuengirola, La Cala de Mijas. Entry level is composed of a beautiful hall with gallery, a fitted kitchen. a spacious lounge / dining room with open fireplace and direct access to the porch / garden, one bedroom en-suite. Guest toilet. Upper level comprises three further bedrooms, all en-suite, with built-in wardrobes, all with access to open terrace with open views. Qualities include A/C hot and cold, alarm system, cream marble floors, double glazing, open fireplace, water deposit, etc. The property is set in beautiful gardens with private swimming pool, fountain, BBQ. 4 bedrooms, 4 bathrooms, 1 guest cloakroom. Another 5 star property for sale in Spain from Bargain Properties. Villa in San Diego, 3 bedrooms, 2 bathrooms, mature garden, panoramic views and walking distance to the beach. San Diego is a beautiful residential area of villas only overlooking the Mediterranean sea, Africa and Gibraltar at just five minutes from Sotogrande. This gorgeous house of 180sq. m. in one floor is located in a privileged point within the urbanization and enjoys panoramic uninterrupted views to the sea at just five minutes walking from the underground path to the beautiful beach in Torreguadiaro. The house consists of entrance hall, large fitted kitchen-diner, vast lounge-dining room with fireplace, large partly covered terrace, three very spacious bedrooms and two bathrooms, being one en-suite. There is an extra small room/storage within the property. This villa is being built on a plot of 1.100sq. meters and has a basement (it is possible to built a guess apartment or extend the house) where actually we find the large garage with space for three cars and a water tank of 1.200 litres with an automatic pump. Floors and bathrooms were updated a few years ago, upvc windows with double glazing, security bars and heat pump for the air con in bedrooms. Mature garden and large pool to enjoy the fantastic climate in Costa del Sol. Another 5 star property for sale in Spain from Bargain Properties.